Upper berth: Hummus and Lamb Ghallaba from Beirut Palace. Lower berth: Broccoli, Carrots, Grape Tomatoes. Piggy holds the Garlic Sauce. Chickie holds the meds. As most people know, I started making little bento lunches for myself last winter, partly in an effort to lose weight, mostly in an effort to save money. 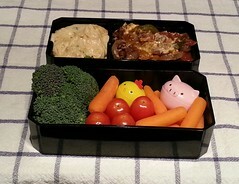 These aren’t as elaborate or colorful as traditional Japanese bento lunches, but they are delicious, fun to eat, and it makes me remember to take my meds (Chickie!). I mostly use leftovers from lunches and dinners, but every once in a while, I get up a little early and makes myself something special. Today wasn’t one of those days, but it’s Monday, snowing out, and my pants were telling me I needed to lay off the junk.